We believe that God has a plan for all of us. Maybe we were meant to meet; perhaps this was his plan for us? We understand that the decisions that you are making right now are difficult. Though we cannot know how you're feeling, we can tell you that we admire the strength and courage that you have to consider adoption on for your baby. Thank you for taking the time to learn more about us. We have one beautiful son named Isaiah that we were blessed with through adoption in 2011. The first time we held him it was like we had finally found a missing piece of our puzzle. Our love for him was instantaneous and powerful. Isaiah is the light of our lives. He keeps us laughing with his charming wit and sense of humor. He is such a loving and intelligent boy with a bright smile and beautiful brown eyes. We have loved and cherished every minute of raising him to this point. One of the things that we love most is watching him experience things and being able to introduce him to new experiences and places. We like to travel and enjoy exploring new places as a family. He enjoys being active and loves to ride his bike, take Karate and play basketball. We can't wait to see what the future holds for him and we plan to continue to afford him every opportunity that we can for him to have a bright and successful life. We have a lot of love to give and we are excited to have another child to complete our family. We are a transracial family and understand how important it is to honor the heritage of our son and our future child. We are fortunate to have much diversity in our extended families as well. Corey's sister has two sons who are biracial (Caucasian/African American). Faith's brother-in-law is Vietnamese and Faith's sister and he just had a baby this past year. These are only a few examples of our families diversity, but also the ones that our son and future child will interact with the most. We began talking about diversity very early with our son and have exposed him as he has grown to African American history and culture. It is a open conversation in our home and no question or feeling is ever not able to be discussed. We have had many discussions about some aspects of our son's cultural history and have always been honest and willing to help him to explore his feelings regarding these topics. Our son loves history and we have been able to take a trip to Washington D.C. where we visited the National African American History museum. We love our son and he is African American so we love teaching him and learning ourselves about African American culture. Our hope is that we raise our children to be comfortable in their own skin, to love who they are and be educated about their ancestry, culture and expose them to as much diversity as we can. We grew up in the same neighborhood and were friends as children. There were many children in the neighborhood where we lived growing up and it was common for a game of baseball or hide and seek to be quickly organized for anyone who wished to join in. We have lots of fond memories of playing tag and kickball with each other and the other children in the neighborhood. We spent our summers swimming and riding our bikes and our winters sledding and building snow forts. Once we were older our friendship grew into a romantic interest and in high school we began dating. We dated for three years before being married. Our shared history is unique, because we have known each other since we were so young and we have many shared childhood memories and friends. We have been married for 19 happy years and have truly built our marriage on a strong foundation of trust and love for one another. We live in a beautiful bi-level home with 3 bedrooms and 2 bathrooms. We have a large, fenced-in yard with a deck for barbecuing and family gatherings. We live in a suburban development that is culturally diverse. Our neighborhood is quiet and friendly, and we have several neighbors with young children. Most of the things that we need are within walking distance of our home. There is a grocery store, the doctor's office, an elementary school and a few local restaurants. There is a large playground just around the corner from our home with slides, swings and jungle gyms. The best part of the playground is a dragon that's made of recycled tires that the kids enjoy climbing on. We also have baseball and soccer fields next to our neighborhood and there are games going on almost every evening in the spring and summer. We enjoy walking around a bike path that is also nearby. Each summer the town we live in has certain events we have a block party and carnival for the children, complete with rides, games and lots of food. We also live close to a lake where we are able to go fishing, boating and picnicking. Almost all year long we enjoy walks along the nature trail and hiking around the lake. Our favorite time to go is in the fall because the view with the changing leaves is breathtaking. Our son has just learned how to ride his bike and we can't wait to be able to take him on some longer rides around the lake this year. Our families are very important to us. They play a major role in our lives and will also be a large part of this child's life. Our families live close to us so we spend a lot of time with them. We get together with them for holidays and special occasions, but most of the time we get together for no reason other than we just like to spend time together. 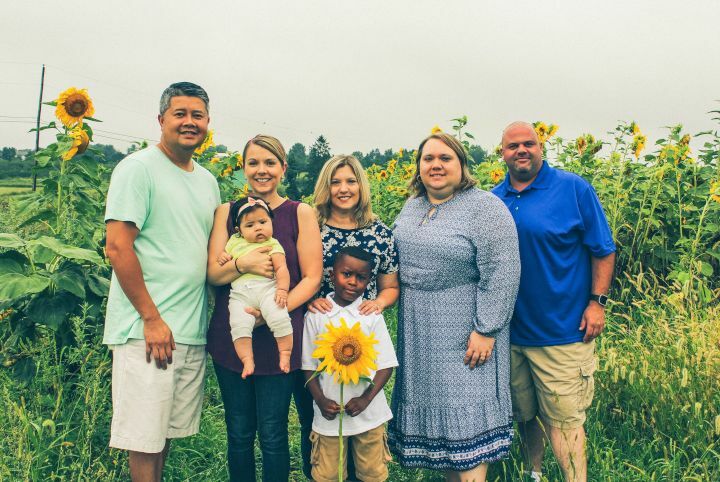 Our families are both very supportive of our adoption plans, and they can't wait to have another baby in the family to love. Our child will have two sets of eager grandparents and a set of great grandparents who will lavish them with affection and love. It was a beautiful experience to witness the total acceptance and love that our families gave to our son when we adopted him. This time we know will be no different. Some of our favorite memories are just spending time with our families at summer picnics or Faith's family rents a house at the beach every other year and the whole family spends a week vacationing together. We both have sisters and we are eager for our son to experience being a big brother and all of the joys that that entails. We are close with our siblings and their families and know that we want our son to have the opportunity to have these kind of relationships as well. As we began writing, we wondered how a letter could ever express our feelings about adoption or the depth of the love we have to share with a child, and we quickly realized that our feelings are beyond words. We hope that this letter accomplishes letting you know who we are and what kind of parents we will be. We can give a child a secure home overflowing with love, laughter and encouragement for them to accomplish their every dream. Our children will have both a mother and father that love them deeply, unconditionally and who will think of them first in every decision that they make. We both believe in traditional family values including dinners spent together around the table just discussing our day, holidays spent with our extended families filled with laughter and family vacations spent exploring new places together as a family. We were high school sweethearts who married soon after we both graduated. We began dreaming of building a family and making plans for our future. We soon learned that life is unpredictable and that sometimes Gods plans are not the same as our own. For 10 years we struggled with infertility and pregnancy loss. Going through infertility treatments and experiencing multiple miscarriages were some of the hardest experiences of our lives. It was during those darker days that we strengthened our marriage and really leaned on each other. As we came to the end of that journey we were stronger as a couple and knew that we still wanted to have a family. We just wanted to love and parent a child so we began exploring adoption. It didn't matter if they looked like us or we shared DNA those things were just not important to us. We know now that God intended us to meet our son and that he was always meant to be a part of our family. Adoption brought us together in such a beautiful way. Everything that we had been through suddenly made sense when he was placed in our arms. Parenting him for the last seven years has been amazing and he is the joy of our lives. We believe that God is once more guiding our steps to another child that is meant to join our family. We are ready to add to our family and share our love another child. Our extended families are thrilled and our Son is so excited to be a big brother. We have great respect for the decisions you are making and know that a decision like this could only be made out of true love for your child. If you choose us to parent your child we would be more than happy to keep in touch with you and keep you updated through pictures and letters. We want you to be able to see this child's smiling little face and experience their milestones with us if you desire to. It is important to us that the child we raise knows that they are loved not only by us but also by their birth parent(s). We plan on telling them from the very beginning about the beautiful choice their birth family made and how that choice made us a family. We promise to always celebrate our child's adoption and the selfless choice that brought us together. As you read this know that our prayers are with you. We admire your love for your child and your bravery for considering adoption. We know that without loving and courageous people like you, we would never have had the chance to be parents. There are two great days in a persons's life theday we are born and the day we discover why.